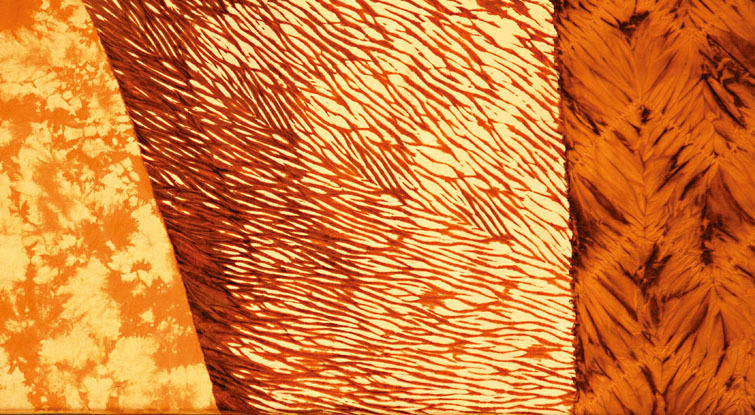 Each pallet of light gold on the drying rack is a gift from the intertwining relationship between the winds and the mountains, men and land. 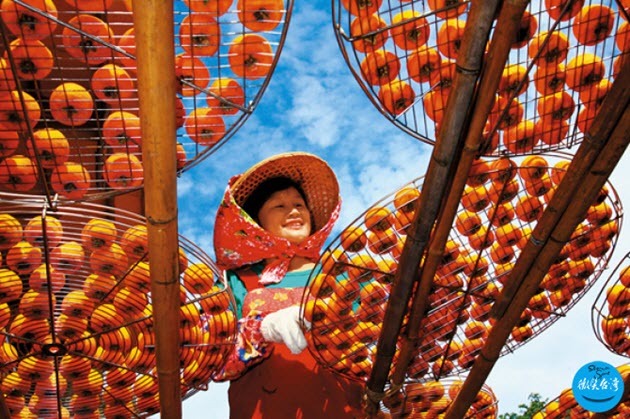 The Winds of September, which are peculiar to HsinPu, HsinChu, have filled the village with fragrance of persimmons. Down the sinuous path, in front of a traditional Hakka dwelling, the mistress of Wei Wei Jia Tourist Farm was raking leaves. 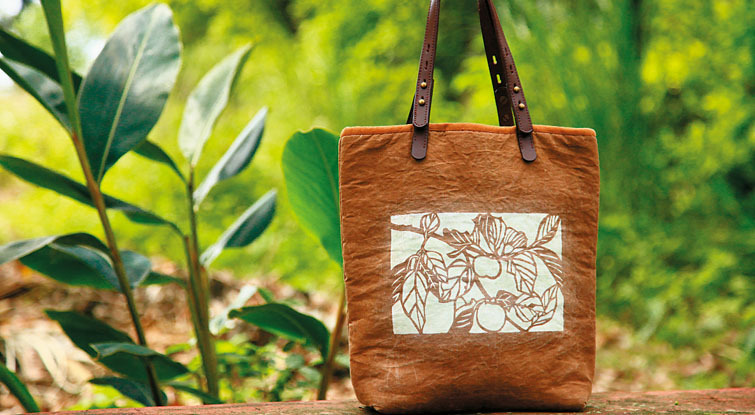 “Persimmons are highly connected to the Hakka’s history and lifestyle,” she told us. 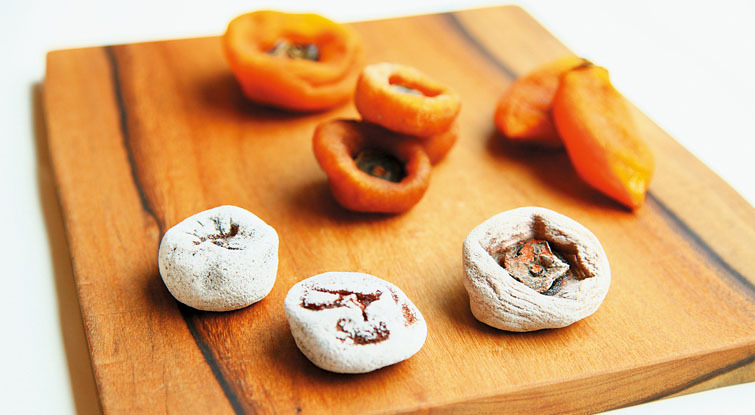 The history of dried persimmons in HsinPu has entered its third century, contributing up to 80% of the total production of persimmons in Taiwan. “It takes the right time, the right place, and the right relationships for this business to succeed and be passed down to us today. The name of the village, Han-Keng (dry pit), implies its lack of rain. It is the lack of rain and the cold Winds of September that provide the best environment for making dried persimmons. As for the right relationships, ask my silly brother.” Chen-Chu Liu, the ‘second sister,' as called by the other photographers, said cheerfully, as she brewed a pot of their own produced tea. The Second Sister showed us a brown stuffed toy. 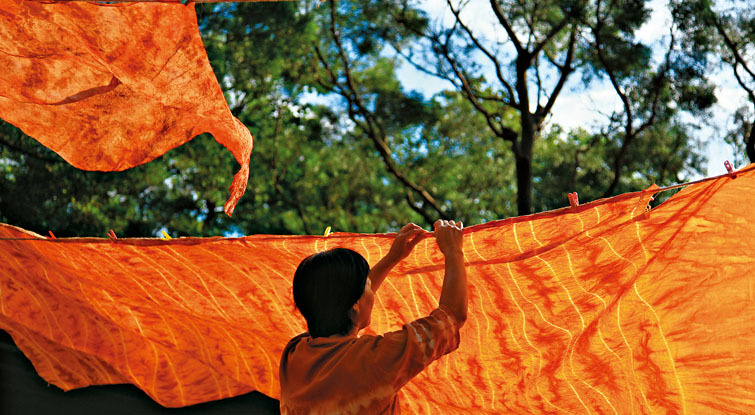 “This was a gift from our mother.” It showed the work from the hands of the mother, who not only raised the family up, but also brought the technique of “persimmon dye” to life. “Look at that pillar. In her late years, Mother’s knee and back stiffness problems caused by long hours of persimmon peeling, forced her to use that pillar to support herself up after sitting another whole day peeling persimmons. It were the stains of the juice on the pillar that inspired her the idea of persimmon dye.” Today, HsinChu County Government instructed the township office and the community volunteers to establish The Persimmon Dye Culture Council, an organization committed to designing persimmon-dyed products, with a view to passing down the warmth left on the pillar from the fingers of Lu’s mother. With the pallet of wisdom passed down by the ancestors, the Winds of September, the sun , the land, and the simple villagers, together breathe a golden hue into the lands of HsinPu.